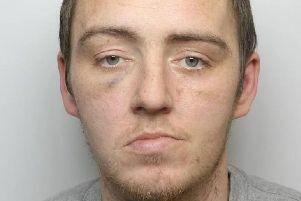 Daniel Kaye who was sentenced to 40 months in prison at Leeds Crown Court. A career criminal has been jailed after breaking into the home of an elderly woman while she was asleep in a bid to fund his lifelong drug addiction. A judge at Leeds Crown Court told Daniel Kaye, of Westfield Street, Ossett that he had left his victim "traumatised" as the 35-year-old was sent to prison for 40 months. The hearing this morning (Wednesday) heard that on February 3 of this year a resident of Ingfield Avenue in Ossett woke to find damage to the back door of his house. A neighbour had seen Kaye at the scene at around 1.15am and an electronic tag confirmed he had been there. Two days later on Lady Close in Ossett, a house-holder was woken by a tapping sound, looked out of the window and saw Kaye who made off when he shouted to him. The court heard he had been seen trying other doors on the street. A short time later at 1.07am police were called to the home of a 74-year-old woman after neighbours had seen a burglary taking place at her home in Clifton Terrace just a few streets away. Police arrived, along with a police dog and found Kaye inside the house, while the woman was in bed upstairs. He had taken a purse from the pensioner's bag which was later recovered. He had been seen shining a torch into the lock of the door before going in the house and closing the door behind him as well as having a screwdriver with him. For the prosecution, Louise Gallagher said Kaye had intended to steal to fund his drug habit and asked the courts to take 17 other matters into consideration, eight of which took place between January 13 and February 4 this year. He had stolen £1,000 worth of goods and caused more than £2,000 worth of damage. Jessica Heggie, defending, said her client had "expressed sincere remorse for the offences and his record". She added: "He is desperate for a fresh start and is entirely fed up with his old lifestyle". Judge Penelope Belcher sentenced Kaye to 40 months in prison for two counts of attempted burglary of a dwelling and one count of burglary of a dwelling. The sentences will run alongside each other. She said: "It is a significant impact on a lady of 74 who ought to be able to go about her everyday life without fear of returning home to a possible burglary. It is clear that this offence is fuelled by drugs and you have a life-long drug habit. If you can't resolve the drug addiction you will continue to offend."